Objectives: Liver transplantation is the well-known treatment for chronic liver diseases; however, post-operative complications and lack of donors continue to be limitations with this treatment. Investigating new modalities for treatment of chronic liver illness is a must. In the present study, we aimed to clarify the effects of an in vitro hepatocyte-differentiated human unrestricted somatic stem cell transplant as a new cell-based therapy in an experimental model of chronic liver failure. Materials and Methods: Human umbilical cord blood-derived unrestricted somatic stem cells were isolated, cultured, propagated, and characterized. Cells were directed to differentiate into hepatocyte-like cells. An animal model of carbon tetrachloride cirrhotic liver failure was prepared, and the human in vitro differentiated unrestricted somatic stem cells were transplanted into the experimental model. Animals that did not receive transplant served as the pathologic control group. Animals were euthanized 12 weeks after transplant, and liver functions and histopathology were assessed. Results: Compared with the pathologic control group, the transplant group showed improvements in levels of alanine aminotransferase, aspartate aminotransferase, albumin, and bilirubin. Histopathologic examination of the transplant group also showed improvements in hydropic degeneration and fibrosis. Conclusions: The use of unrestricted somatic stem cells, isolated and propagated from cord blood and then differentiated into hepatocyte-like cells, improved both fibrosis and normal function of cirrhotic livers. These cells could be considered as a line of cell-based therapy in cases of chronic liver disease. Unrestricted somatic stem cells (USSCs) are multipotent stem cells that can differentiate in vitro or in vivo into a variety of cell types, including osteocytes, chondrocytes, adipocytes, and many other cell lineages. They also can differentiate into hepatocytes.5 These cells are classically obtained from the bone marrow, which are referred to as marrow stromal cells.6 Because bone marrow isolation is a painful procedure, searching for new sources remains of utmost importance. Stem cells have gained interest for their potential to support tissue regeneration with few com-plications in liver diseases.7,8 Here, we investigated in vitro hepatocyte-differentiated stem cells as a line of treatment to restore liver function in a short time. 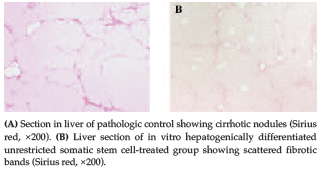 Specifically, we studied the effects of in vitro hepatocyte-differentiated USSC transplant in an animal model of experimentally induced carbon tetrachloride (CCl4) liver cirrhosis to reach the best protocol for application in humans. This work was started in 2013 and was conducted over 3 years. All experiments were conducted in accordance with the rules and regulations of the Theodor Bilharz Research Institute Ethical Committee (Giza, Egypt). After written consent from the mother was obtained and after delivery of a full-term baby, the umbilical cord was clamped and 50 to 70 mL of cord blood were collected from the umbilical vein using a 50-mL heparinized (5000 IU/ml heparin) syringe with a wide-bore needle. Collected blood was transferred to the laboratory at 8°C to 10°C and processed within 6 hours. Only samples that tested negative for infections were used; infected samples were excluded. Included samples tested negative for hepatitis C virus antibodies, hepatitis B surface antigen, and human immunodeficiency virus antibodies (Acon Labo-ratories, San Diego, CA, USA). Blood was diluted with phosphate-buffered saline (PBS) (Lonza, Verviers, Belgium) at a ratio of 1:1.5, and mononuclear cells were isolated with the use of a density gradient cell separation technique using Ficoll according to the manufacturer’s instructions (Lonza). Cells were spun twice at 200g for 10 minutes with PBS. Pellets were resuspended in Dulbecco’s modified Eagle’s medium (DMEM), and cells were counted using hemo-cytometer and tested for their viability with the Trypan blue exclusion test (Invitrogen, Carlsbad, CA, USA). Cells were cultured at a density of 1 × 106 cells/cm2 into cell culture flasks using low-glucose DMEM (Lonza) supplemented with 20% fetal calf serum (Invitrogen), 1% penicillin/streptomycin (Biochrom, Cambridge, UK), and 1% L-glutamine (Lonza) and incubated in a 5% CO2 incubator at 37°C and inspected for colony-forming units. The USSC colonies were collected and cultured in new flasks. Media were changed twice weekly until cells reached a confluency of 70% to 90%. Once a confluency of 70% to 90% was reached, the cells were trypsinized. The adherent cell layer was washed with PBS and incubated at 37°C for 10 minutes. We added 2.5% trypsin (Euroclone, Pero, Italy) to the flasks for another 7 minutes. Detached cells were collected and washed with PBS by centrifugation. Pellets were resuspended in an appropriate amount of media, and cells were counted using hemocytometer, tested for viability by Trypan blue, and plated in new flasks for the next passage. 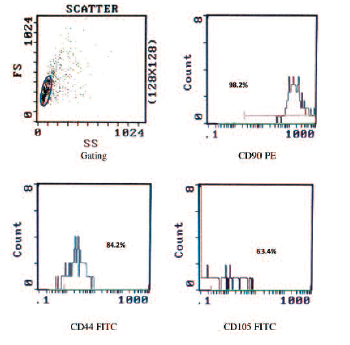 Third-passage cells were characterized by flow cytometer using monoclonal antibodies for USSC markers (CD105 conjugated with fluorescein isothiocyanate [FITC], CD44 conjugated with FITC, CD90 conjugated with phycoerythrin) and exclusion markers (CD45 conjugated with the FITC common leukocytic marker and CD34 conjugated with the FITC hematopoietic stem cell marker). Unrestricted somatic stem cells were harvested with trypsin and washed with PBS supplemented with 5% fetal bovine serum and then counted with a hemocytometer. Approximately 10 000 to 20 000 USSCs were stained at room temperature with antibodies per manufacturer’s instructions and analyzed in a flow cytometer (Beckman Coulter Epics XL-MCL, Fullerton, CA, USA) collecting 10 000 events. Unstained cells served as controls. Gene expression in the cultured cells was also tested using QuantiTech SYBR green polymerase chain reaction (Qiagen, Valencia, CA, USA) to assess SOX2, KLF4, OCT4, Nanog, and DLK1 gene expression. Third-passage cells were cultured in hepatogenic differentiation medium I, which consisted of DMEM supplemented with 1 μL/mL hepatocyte growth factor (R&D Systems, Minneapolis, MN, USA), 2 μL/mL fibroblast growth factor 4 (R&D Systems), 2.5 μL/60 mL endothelial growth factor (R&D Systems), 1% penicillin/streptomycin, 1% L-glu-tamine, and 1% fetal bovine serum. Medium was changed twice weekly for 2 weeks. After 2 weeks, hepatogenic differentiation medium I was replaced with hepatogenic differentiation medium II, which consisted of DMEM supplemented with 1 μL/mL hepatocyte growth factor, 2 μL/mL fibroblast growth factor 4, 24 μL/60 mL oncostatin M, 5 μL/mL ITS-4 (R&D Systems), 4 μL/mL dexa-methasone, 1% penicillin/streptomycin, 1% L-glutamine, and 1% fetal bovine serum. Medium was changed twice weekly for 2 weeks. Cells were characterized by monitoring the morphologic changes over the period of differentiation, with assessment of the cell’s synthetic function by analysis of albumin in culture medium using the albumin human enzyme-linked immunosorbent assay kit (Abcam, Cambridge, UK) and the cell’s execratory function using indocyanine green stain. We used hematoxylin and eosin (H&E), periodic acid Schiff, and immunoperoxidase staining for cytopathologic analyses using antihuman primary antibodies against albumin and alpha-fetoprotein (AFP) (Novus Biologics, Littleton, CO, USA). Three-month-old BALB/c mice weighing approx-imately 40 g were used for model preparation. The mice were given rodent chow and water and were maintained in 12:12-h light/dark cycles. All expe-riments were carried out in accordance with the rules and regulations of Theodor Bilharz Research Institute Ethical Committee for handling of laboratory animals. Only healthy animals were used; pregnant or physically injured animals were excluded. Fifty mice were intraperitoneally injected with (1:4) CCl4-corn oil emulsion at a dose of 0.5 mL/kg body weight at 2 times/week. After 8 weeks, one animal was euthanized so that we could histo-pathologically examine the liver for effects of the CCl4. Remaining animals received CCl4/corn oil emulsion for another 4 weeks. A second animal was killed on week 12 of injection (4 weeks after the 1st animal was killed) to allow us to examine the degree of fibrosis. We detected liver cirrhosis at 12 weeks in the examined animal sample, at which time living animals were intrahepatically injected with in vitro hepatocyte-differentiated USSCs. The remaining mice were divided into 2 groups: a pathologic control group and a transplant group. Normal mice served as normal controls. The pathologic control group received CCl4 but received no further treatment. The transplant group received CCl4 and then were intrahepatically injected once with 1 × 106 in vitro hepatocyte-differentiated USSCs in 0.1 mL PBS/each. Twelve weeks after transplant, all mice were euthanized, their livers were dissected, and blood samples were collected. Hepatic tissue specimens were fixed, processed, and stained with H&E for histologic examination and Masson stain and Sirius red for assessment of the degree of fibrosis. Liver sections were also stained with primary antibodies against human AFP and albumin according to instructions. Serum levels of aspartate aminotransferase (AST), alanine transaminase (ALT), albumin, and bilirubin were measured and compared with samples obtained from the pathologic control group to assess the synthetic, secretory, and excretory functions of the liver. Data were analyzed using SPSS version 18.0 for windows (SPSS Inc., Chicago, IL, USA). Laboratory results from different groups were compared with one-way analysis of variance. P ≤ .05 was considered statistically significant. Umbilical cord blood-derived USSCs (UCB-USSCs) started to appear as a monolayer on day 22, and 90% to 95% confluency was reached 3 days later (Figure 1). 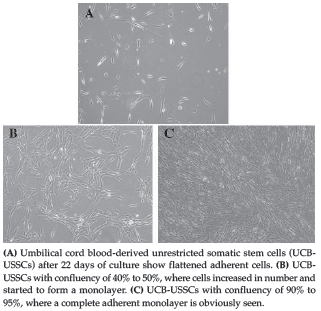 Umbilical cord blood-derived USSCs were cultured for 50 days along 12 passages. In the first 6 passages, all cells collected by trypsinization were cultured; passage doubling rate and the final doubling rate from the 1st to 6th passage were calculated using the following formula according to Kern and associates9: doubling rate = log(NH) log(N1)/log (2), where N1 is the initial number of cells and NH is the number of cells in the confluent layer. The lag period (time to reach 90% to 95% confluence) of each passage was 2 to 3 days in the first 6 passages with a doubling rate range of 0.48 to 4.17 and a final doubling rate of 7.13 (Table 1). After passage 6, most of the cells were cryo-preserved, with only a small fraction cultured to continue to the next passage. The lag period of each passage was 6 to 7 days, the doubling rate range was 0.93 to 3.2, and the final doubling rate was 10.12 (Table 2). Cultures were abandoned when cells ceased proliferation and showed criteria of senescence (vacuolation, granulation, or become rounded as described by Kern and associates9 and Qiao and associates10). In our work, we observed the senescence criteria in passage 12 of UCB-USSCs (Figure 2). Characterization of cultured USSCs was performed by surface flow cytometric analysis after passages 3 and 5 of the UCB-USSCs. Cells were uniformly positive for endoglin receptor CD105 (94.80%), extracellular matrix protein CD90 (93.30%), and hyaluronate receptor CD44 (96.00%). 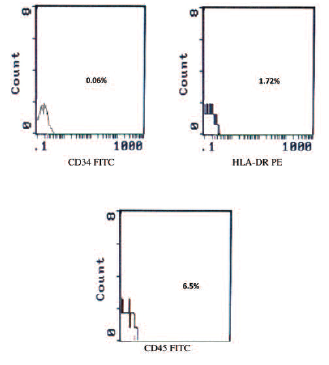 Cells were negative for leukocyte common antigen CD45 (6.5%) and hematopoietic progenitor cell marker CD34 (0.06%) (Figure 3 and Figure 4). Cells were positive for SOX2, KLF4, OCT4, Nanog, and DLK1 genes. The double-phase technique was used to transform USSCs into hepatocyte-like cells in 28 days, as con-firmed by morphologic changes, histopathologic studies, immunoperoxidase staining, and function assessment. At day 14, the cells started to lose the spindle shape of USSCs and gained the cuboidal shape with granulations. 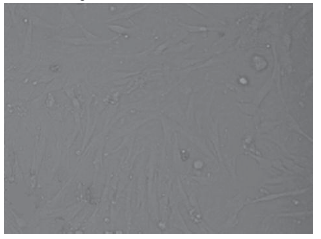 By day 21, a few cells detached and lost the characteristic adhesion phenomena of USSCs, indicating successful differentiation into mature hepatocyte-like cells. Differentiated cells stained with H&E appeared as polygonal epithelial cells (approximately 40 μm in diameter), with eosinophilic cytoplasm, basophilic stippling, and single or double centrally located large nucleus. Periodic acid Schiff-stained differentiated cells showed intense pink cytoplasmic granules, denoting glycogen presence. Both AFP and albumin were expressed, denoting successful differentiation. Albumin concentrations in the culture media had gradually increased throughout the differentiation period (from 2.3 ng/dL on day 0 to 30.0 ng/dL on day 28), indicating good synthetic function of the differentiated cells (Table 3). Cells took up the indocyanine green stain after 20 minutes and re-execrated it in 6 hours, indicating good execratory function in the differentiated cells. Of 50 mice initially targeted for analyses, 27 mice died during the period of injection and 5 mice were excluded due to pregnancy or physical injury. Two mice were euthanized to assess liver fibrosis and function; one was euthanized after 8 weeks and showed minimal liver fibrosis, and one was euthanized 4 weeks later, which showed liver fibrosis level of A4F4 according to the METAVIR scoring system. Microscopic examination of the liver of the 2nd animal showed loss of normal hepatic architecture with severe hydropic degeneration of the hepatocytes. Walls of portal tracts appeared thickened with chronic inflammatory cell and variable degrees of fibrosis. The animal also had regenerating nodules in the liver specimen. The remaining 16 mice were divided into 2 groups: a pathologic control group and a transplant group. Eight healthy mice served as the normal control group. Table 4 summarizes the animals groups. Mice transplanted with human mesenchymal stem cell-derived hepatocyte-like cells showed spotty necrosis with dilated congested sinusoids in 2 of them. Only 2 mice of 8 showed intact hepatic lobular architecture with mild hydropic degeneration, with the remaining 6 mice showing intact hepatic lobular architecture with moderate hydropic degeneration (Figure 5). 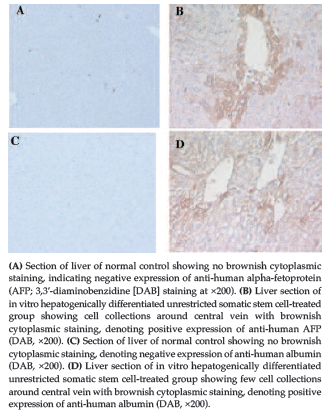 Liver specimens from the transplant group, when stained with antihuman albumin and AFP immunoperoxidase, showed characteristic brownish cytoplasmic staining, denoting positive expression of both albumin and AFP. Results showed that 21.0 ± 13.20% of cells expressed human AFP and 11.00 ± 8.00% of cells expressed human albumin. These finding indicate successful engraftment and in vitro differentiation into hepatocyte-like cells (Figure 6). A highly significant improvement of fibrotic index (3.0 ± 0.70) was shown in the transplant group compared with the pathologic control group P < .01), as verified by Sirius red stain (Figure 7). Mice in the transplant group showed improved AST, ALT, albumin, and bilirubin levels (with significance and high significance) compared with the pathologic control group. These results are shown in Table 5. Chronic liver injury often leads to liver fibrosis, cirrhosis, and cancer. Liver cirrhosis was considered an irreversible disease, as it was nearly impossible to reverse the fibrotic changes with conventional treatments.11 However, these outcomes have changed with research. Although liver transplant is a standard therapy for patients with liver failure, other approaches have been proposed, in particular cell-based therapies. Stem cells may be used instead of orthotopic organ transplant to replace the missing liver functions. We found that USC-USSCs had differentiated into hepatocyte-like cells as shown by their morphologic changes, including increased albumin levels in culture media, positive indocyanine green and periodic acid Schiff staining tests, and expression of hepatocyte markers (AFP and albumin) by immuno-peroxidase staining. Lee and associates24 and Schwartz and associates25 also succeeded in the in vitro differentiation of USSCs to hepatocytes using similar differentiation protocols. 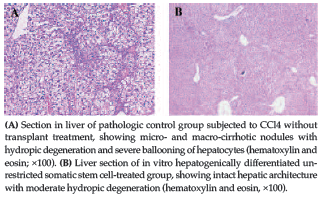 The therapeutic effects of differentiated USSCs on liver cirrhosis could be attributed to the fact that a large number of healthy hepatocytes are needed to maintain function in normal adult livers. In livers with severe cirrhosis, hepatocytes are markedly reduced in number,29 and supplying cirrhotic livers with adequate numbers of healthy hepatocytes, from the differentiated USSCs, may restore normal liver function. Cord blood-derived USSCs proved to be a promising candidate for cell-based therapy in liver regeneration on an experimental level. We were able to successfully isolate, culture, and expand human USC-USSCs. The full characteristic features of USSCs were shown, and their expansion potentials were analyzed. A double-phase protocol for hepatogenic differentiation of USSCs showed satisfactory results, as confirmed by our multistep characterization process of the differentiated cells, as was our protocol for developing the liver failure animal model. We observed improved liver function and slowed progression of liver fibrosis in the differentiated USSC-treated mice compared with the pathologic control group. Further studies on higher animal models are recommended. In addition, the use of dual therapeutic cell modalities (differentiated and undifferentiated USSCs) in further experimental trials are also recommended for a simultaneous improvement in both fibrosis and functional activity parameters. Wu B, Song HL, Yang Y, et al. Improvement of liver transplantation outcome by heme oxygenase-1-transduced bone marrow mesenchymal stem cells in rats. Stem Cells Int. 2016;2016:9235073. Seo GS. [Stem cell properties of therapeutic potential]. Korean J Gastroenterol. 2011;58(3):125-132. Shrihari TG. Cancer stem cells - therapeutic boon. J Cancer Sci Therap. 2011;3:197-200. Garcia JM, Mendonca L, Brant R, et al. Stem cell therapy for retinal diseases. World J Stem Cells. 2015;7(1):160-164. Navarro-Alvarez N, Soto-Gutierrez A, Kobayashi N. Stem cell research and therapy for liver disease. Curr Stem Cell Res Ther. 2009;4(2):141-146. Avasthi S, Srivastava RN, Singh A, Srivastava M. Stem cell: past, present, and future---a review article. Internet J Med Update. 2008;3:22-30. Lorenzini S, Gitto S, Grandini E, Andreone P, Bernardi M. Stem cells for end stage liver disease: how far have we got? World J Gastroenterol. 2008;14(29):4593-4599. Larijani B, Esfahani EN, Amini P, et al. Stem cell therapy in treatment of different diseases. Acta Med Iran. 2012;50(2):79-96. Kern S, Eichler H, Stoeve J, Kluter H, Bieback K. Comparative analysis of mesenchymal stem cells from bone marrow, umbilical cord blood, or adipose tissue. Stem Cells. 2006;24(5):1294-1301. Qiao C, Xu W, Zhu W, et al. Human mesenchymal stem cells isolated from the umbilical cord. Cell Biol Int. 2008;32(1):8-15. Friedenstein AJ, Chailakhjan RK, Lalykina KS. The development of fibroblast colonies in monolayer cultures of guinea-pig bone marrow and spleen cells. Cell Tissue Kinet. 1970;3(4):393-403. Rebelatto CK, Aguiar AM, Moretao MP, et al. Dissimilar differentiation of mesenchymal stem cells from bone marrow, umbilical cord blood, and adipose tissue. Exp Biol Med (Maywood). 2008;233(7):901-913. Meyerrose T, Olson S, Pontow S, et al. Mesenchymal stem cells for the sustained in vivo delivery of bioactive factors. Adv Drug Deliv Rev. 2010;62(12):1167-1174. Kogler G, Sensken S, Airey JA, et al. A new human somatic stem cell from placental cord blood with intrinsic pluripotent differentiation potential. J Exp Med. 2004;200(2):123-135. Peters R, Wolf MJ, van den Broek M, et al. Efficient generation of multipotent mesenchymal stem cells from umbilical cord blood in stroma-free liquid culture. PLoS One. 2010;5(12):e15689. Mueller SM, Glowacki J. Age-related decline in the osteogenic potential of human bone marrow cells cultured in three-dimensional collagen sponges. J Cell Biochem. 2001;82(4):583-590. Mareschi K, Biasin E, Piacibello W, et al. Isolation of human mesenchymal stem cells: bone marrow versus umbilical cord blood. Haematologica. 2001;86(10):1099-1100. Stenderup K, Justesen J, Clausen C, Kassem M. Aging is associated with decreased maximal life span and accelerated senescence of bone marrow stromal cells. Bone. 2003;33(6):919-926. Wexler SA, Donaldson C, Denning-Kendall P, et al. Adult bone marrow is a rich source of human mesenchymal “stem” cells but umbilical cord and mobilized adult blood are not. Br J Haematol. 2003;121(2):368-374. Bieback K, Kern S, Kluter H, Eichler H. Critical parameters for the isolation of mesenchymal stem cells from umbilical cord blood. Stem Cells. 2004;22(4):625-634. Musina RA, Bekchanova ES, Belyavskii AV, Grinenko TS, Sukhikh GT. Umbilical cord blood mesenchymal stem cells. Bull Exp Biol Med. 2007;143(1):127-131. Perdikogianni C, Dimitriou H, Stiakaki E, Martimianaki G, Kalmanti M. Could cord blood be a source of mesenchymal stromal cells for clinical use? Cytotherapy. 2008;10(5):452-459. Lee OK, Kuo TK, Chen WM, et al. Isolation of multipotent mesenchymal stem cells from umbilical cord blood. Blood. 2004;103(5):1669-1675. Schwartz RE, Linehan JL, Painschab MS, et al. Defined conditions for development of functional hepatic cells from human embryonic stem cells. Stem Cells Dev. 2005;14(6):643-655. Mou XZ, Lin J, Chen JY, et al. Menstrual blood-derived mesenchymal stem cells differentiate into functional hepatocyte-like cells. J Zhejiang Univ Sci B. 2013;14(11):961-972. Oyagi S, Hirose M, Kojima M, et al. Therapeutic effect of transplanting HGF-treated bone marrow mesenchymal cells into CCl4-injured rats. J Hepatol. 2006;44(4):742-748. Christ B, Bruckner S, Winkler S. The therapeutic promise of mesenchymal stem cells for liver restoration. Trends Mol Med. 2015;21(11):673-686. Seki A, Sakai Y, Komura T, et al. Adipose tissue-derived stem cells as a regenerative therapy for a mouse steatohepatitis-induced cirrhosis model. Hepatology. 2013;58(3):1133-1142. Acknowledgements: The authors thank Prof. Dr. Hoda Abu Taleb for her support throughout the work. The study was funded by project 5K (TBRI), and there is no conflict of interest with any of the authors.